All ornaments are handmade from recycled materials: Used cartons,newspaper, paper bags, and hand painted with acrylic colors. Lingonberry Hollow Heart , Paper-Mache' Ornament. TINY SANTA BOY with package, Paper-Mache' ornament. MAGNET, Handcrafted paper mache' with text : A red little cottage. 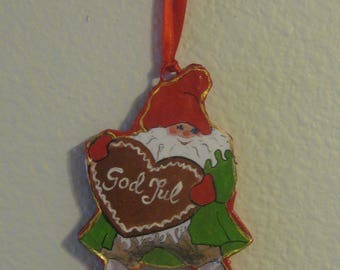 Swedish Norwegian or Danish Heart, Paper-Mache' ornament. This ornament is cheerful and whimsical. It arrived at my doorstep very quickly. I work for a Swedish company, and I am part Swedish...these earrings fit into both my job, and being proud of my heritage.